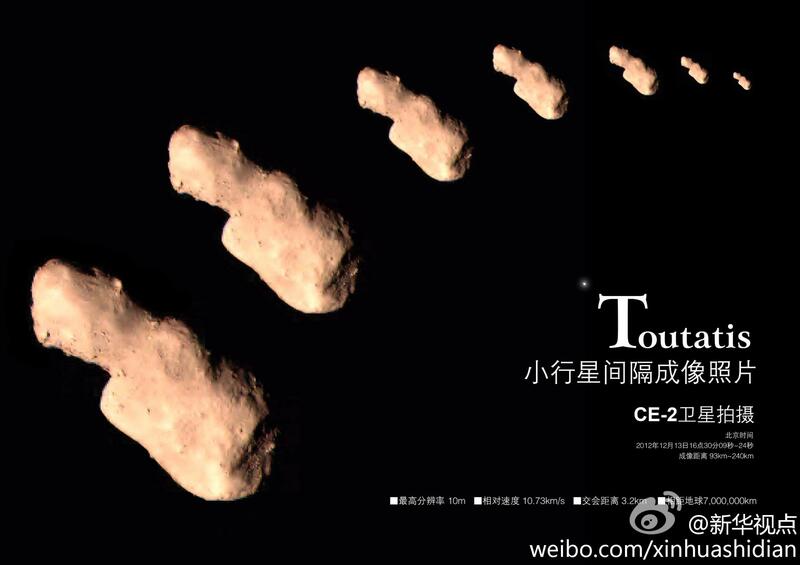 China became the fourth entity capable of observing an asteroid close-up when its lunar probe Chang’e 2 flew within 3.2 km of Toutais at a relative velocity of 10.73 km/s on December 15. “The success of the extended missions also embodies that China now possesses spacecraft capable of interplanetary flight,” said Wu Weiren, chief designer of China’s lunar probe program. The flyby was a secondary mission of Chang’e 2, which launched on October 1, 2010, orbited the Moon for eight months before departing for the Sun-Earth Lagrange point 2, making it the first object to reach L2 directly from lunar orbit. The flyby of Toutatis was the probe’s final task. CCD Photograph of asteroid Toutatis by Chang’e 2 captured at a distance of 93–240 km with maximum resolution 10 meters/pixel (Credits: Chinese Lunar Exploration Program).